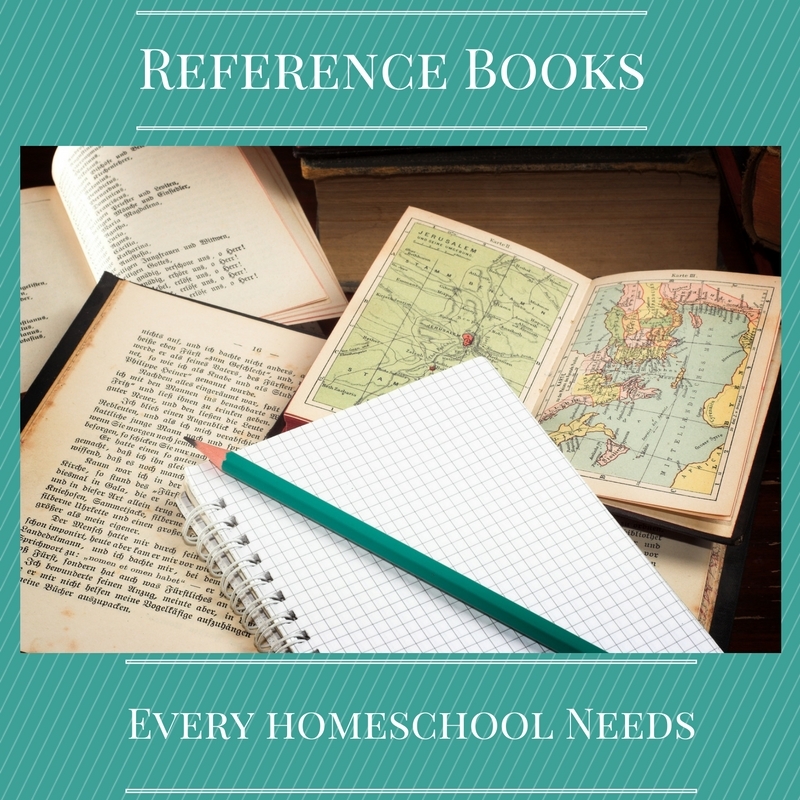 Reference books can make a homeschool mama’s life a little easier on an almost daily basis. “Go look it up”, being a clarion call around here. Part of why we homeschool is that we aren’t interested in spoon-fed little robots that can’t think or solve problems for themselves. Having the tools around the house to encourage children to find answers is the first step toward independent learning. I know that most things can be found via Google these days, and I have been known to Google the occasional algebraic equation or sentence diagram, but people should know how to look things up in books. To absorb information in an intentional and thoughtful way that may lead to further explanation. That’s probably not going to happen by clicking on the first link someone paid Google to stick in your face. These are some of our go to reference materials. Keep in mind these have been collected over the last fifteen or so years so don’t assume you should run out and acquire them all at once. Rather be on the look out at garage sales, used book pages on Facebook, relatives and friends whose children no longer need them, and of course there is always the library (which makes a great excuse to get out of the house). Encyclopedia: When the older kids are doing a research report or just want some general knowledge about a certain subject I do pack them off to the library for a dip in the Encyclopedia Britannica which is too expensive for a normal family to have. For the younger ones I have a vintage set of Childcraft Encyclopedias that a friend passed down to me when I first started homeschooling. The price through that link is a little high, you can generally do better on eBay or Facebook. They are also pretty common to come across at yard sales and tag sales. The older versions have those groovy 80’s style photos and just present the information simply without politically correct nonsense. The same can’t be said for the versions from the late 90’s. Go for the 80’s ones. The How Things Grow book can be an entire year of primary science, presented in an interesting way. These are well worth having in the house. Dictionaries: Goes without saying. I have three, the My First Picture Dictionary for the young ones, A Children’s Dictionary which is for the emerging reader set and then the classic Webster’s Dictionary. I have a big hardbound one that my parents passed on to me (which does not include words such as hipster, emoji and, heaven help us, Trumpster) but I have a few paperback copies which cuts down on arguing, waiting and makes them more portable. Thesaurus: The basic Merriam Webster, we usually start using this in middle school. How Nature Works by David Burnie. This one is available for $.01 at Amazon. It’s a nice overview of all things in nature and how they work. Nothing too in depth but a great place to look up terms or to take on a nature walk to help identify things. It’s supposed to be for 4-8th grades but even the non-readers will enjoy the pictures. It’s a very engaging source of reference material. Handbook of Nature Study by Anna Comstock. This classic work is the most comprehensive nature study book available. Written in 1911 it’s a guide for all things nature (except ocean studies). Find out where a cricket’s ears are or how many petals on a daisy. It’s a benchmark that every homeschool mom should have in her reference arsenal. Natural Science Through The Seasons by James Partridge. 100 units for studying nature. The link takes you to Hillside Education because they have free pdf printables that allows you to make your own nature calendar for your area. The book is a nice addition to a science shelf though not as useful as the Comstock book. The Kingfisher Encyclopedia of Science by Charles Taylor. Just a good all around reference book. Like all comprehensive reference books it’s a little spendy but a good investment, especially if you have a child or children who love science. It’s also in most library reference sections so you can wait to see how many times you use it there before investing. The Way We Work by David Macaulay. Macaulay’s books are always excellent. Well researched, entertainingly presented, beautifully but not commically illustrated. It’s an excellent reference for human anatomy for your homeschool. His other reference books, too numerous to mention here, are all great and you won’t ever be sorry you have them. I really like the Usborne Encyclopedia’s for grammar school reference books in History. We own The Usborne Encyclopedia of World History and The Usborne Encyclopedia of the Ancient World as well as a bunch of other of their history books. Those links are to Amazon but I really prefer to buy these from an independent seller, likely there is one in your homeschool group and they are always at homeschool conferences. The books are presented in a timeline format and are really nicely illustrated. I find them extremely useful for copywork and as a lapbook resource. The Element of Style by William Strunk Jr. This is a timeless resource for grammar questions and writing style reference. I own an older edition but the newer once seems comparable. I also have the MLA Handbook and the Chicago Manual of Style (which most college kids and freelance writers should have ;)) but I mostly refer my young writers to the Element. It’s a handy book to have around. That about covers most of our basics. For Math you used to be able to buy reference books published by Scholastic that were grade level indexed and handy for a quick look up and explanation if the text book was proving confusing. I can longer recommend those types of books because they are all common core aligned and my homeschool is not. Nor will it ever be, so if we get stuck on math we call out personal math help desk, otherwise known as daddy. I hope you find this list helpful. All the Amazon links are affiliate links so if you are kind enough to buy through that then I receive a teeny percentage. Happy shopping. This is a great list! The Element of Style by William Strunk Jr. was free as a Kindle download today ;0) Many thanks!